(2 Customer Reviews) | Write Review 13 issues per year The Horse&Rider magazine app brings you the UK's best-selling equestrian monthly magazine in digital format. Each issue delivers the latest information with interactive features to help you get the most out of your riding and give your horse the best possible care. As a digital reader you'll save money on the cover price, whether you choose to buy a single issue or subscribe with even more savings. The digital edition of Horse&Rider is fully interactive with videos, shopping pages, contest entry forms and links embedded straight into the app. Get in the saddle with expert advice from riding celebrities like Carl Hester and Mary King. Have all of your horsey Q&As answered by our top experts and vets. Discover all the latest gear with our fantastic gear guides with reader reviews! Horse&Rider magazine is perfect for every equestrian whether you're just getting started or you're an accomplished rider. Find a free preview of a sample issue loaded within the My Library tab of the app. Subsequent issues are available for purchase at the stated price. Horse&Rider is published monthly. 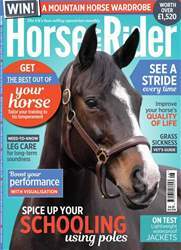 Looking for Horse&Rider Magazine - UK equestrian magazine for Horse and Rider in print? Unfortunately pocketmags.com does not sell print copies of Horse&Rider Magazine - UK equestrian magazine for Horse and Rider, but all is not lost. Our partner at magazine.co.uk sells print subscriptions at the best prices online. August Horse&Rider is out now, and it's packed full of training, management and veterinary advice just for you. Inside you’ll find top tips on how to keep your horse sound and how you can enrich his environment. Plus, Dan Greenwood introduces advanced lateral work and Lucinda Fredericks suggests some great polework ideas to spice up your schooling. There’s also a guide on how to get your approach to a fence right every time, plus we give you a vet’s guide to grass sickness. Don’t miss out on some of the fab prizes up for grabs too including a wardrobe from Mountain Horse and lots more – download your copy of August Horse&Rider now! 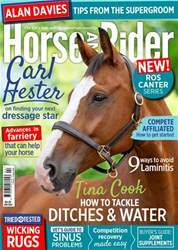 The Horse&Rider magazine app brings you the UK's best-selling equestrian monthly magazine in digital format. Each issue delivers the latest information with interactive features to help you get the most out of your riding and give your horse the best possible care. As a digital reader you'll save money on the cover price, whether you choose to buy a single issue or subscribe with even more savings. 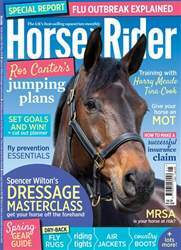 You'll receive 13 issues during a 1 year Horse&Rider Magazine - UK equestrian magazine for Horse and Rider magazine subscription. Just bought some back issues and a subscription. Used to buy it from the feed barn. Really like the way I can access the old issues whenever I like, and it is so quick to open. And this is the best all round read for me. I love this mag and when I got an iPad for christmas thought I would try the digital version. I downloaded the sample for free, no problems. and now I get it sent to my iPad every month. bliss! 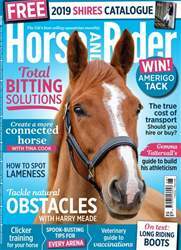 You'll receive 13 issues during a 1 year Horse&Rider Magazine - UK equestrian magazine for Horse and Rider magazine print subscription.